I thought it was about time I featured clothes on my blog, so here we go! This is probably one of my favourite outfits at the moment. First up, the gorgeous dotted peter pan collar dress from Zara. I picked this up during a lunch break on a quick whizz around the shops back in December, and fell in love instantly. The shape is gorgeous, and so flattering, as it seems to be very, very slightly gathered at the bottom. 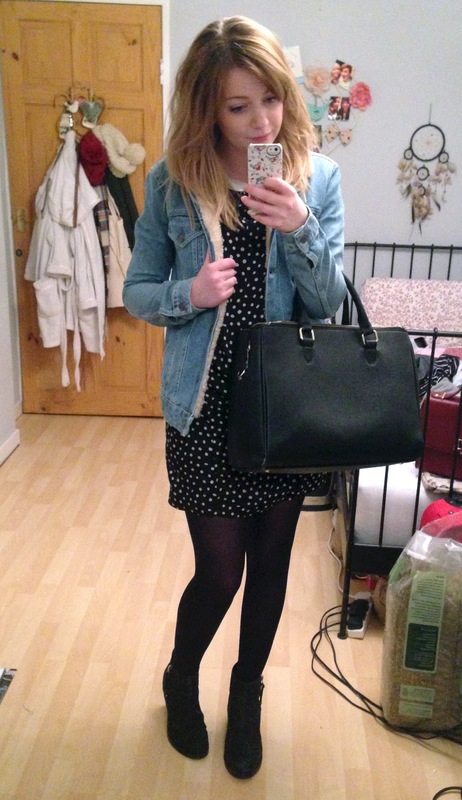 After purchasing, I realised that it's the exact same dress that Zoe had on when I met her. (We were also wearing the same jacket at the time!) I love the way these two pieces fit together, thanks for the subliminal inspiration Zoe! The adorable blue bee necklace was a birthday gift from my good friend Phoebe, I swear it hasn't left my neck since! I love wearing little necklaces with collars, and these two go together perfectly. Next up, the Daniel Wellington watch. I'd had my eye on one of these beautys for SUCH a long time! Christmas arrived, and I was at a loss of what to put on my list - then it hit me. I ended up paying just over half myself, as it's quite an expensive item, but well worth the price! All of the Daniel Wellington watches are breathtakingly beautiful, but I decided to go for the Rose Gold with a Black leather strap. I plan on investing in a Brown leather strap as well, so I can chop and change the look! I managed to grab these Topshop Mighty boots on eBay for a fraction of the retail price, after falling in love with the tan version a few months ago, and nearly wearing them to death. They are so comfortable despite the heel, and pretty much all I've been wearing on my feet since they arrived! 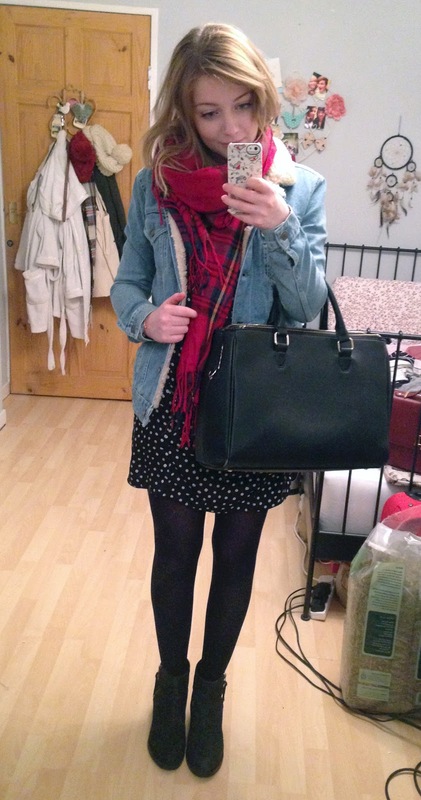 I wish I'd been getting more use out of my denim jacket when the weather wasn't as cold, but I find it's warm enough when also paired with a scarf (as shown) and some nice thick gloves! The shearling lining is so cosy, and makes a change from the usual cold feeling you get when wearing denim jackets.. I'd definitely recommend this! And of course, the ever coveted Zara Office City bag, now sadly out of stock, and seemingly now available only on eBay (for ridiculous prices... honestly!) I love this bag such a lot! I bought it last April (I think) just before I started blogging. It seems everybody was talking about it! I used it a lot during college last year as it was perfect to carry around my art work without worrying about it getting creased. I now use it mainly to transport my MacBook around, as the middle padded compartment fits it perfectly, and keeps it safe too! It also has a zipped padded iPad pocket and a phone pocket, so they've really thought of everything when designing this. It is a little on the large size for everyday use, but for now it's the only black bag I own, after having a huge clear out last year. i love those boots! 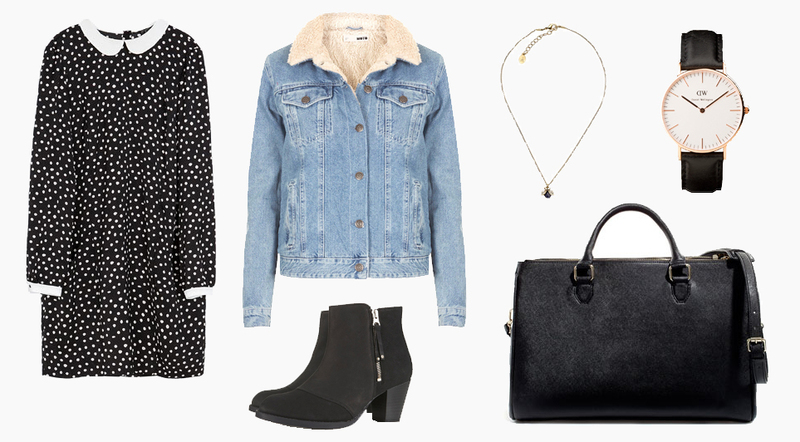 black booties are totally a staple in my closet - you can wear them with practically anything! thanks for visiting my blog :) Yours is so cute! I love this outfit, Amy! You look gorgeous, all of the pieces work so well together. I need to get myself a little bee necklace, I've been looking for one for so long. The one that your friend got you is absolutely adorable. I am also in love with my Zara Office City Bag, it's beyond perfect for school. I'm rather small, so it looks a bit disproportionately big on me, but it fits my laptop and all of my other necessities. Hey lovely! Great post & you look amazing! My friend was wearing this coat today and I wanted to steal it, haha! I just nominated you for the Liebster Award. Check out my post here http://caitacrawford.blogspot.co.uk/2014/01/oh-lots-of-nominations.html :-) if you don't want to do it, that's fine. But if you do, enjoooy! Such a cool outfit. You seem to dress really nicely. Cute outfit! I especially love the watch and the necklace!